We are no middlemen – money goes from your customer straight into your wallet. An easiest way to accept bitcoin payments is through our widgets. You can create a simple and functional payment widget and add it to your website or app following the easy steps in our widget creation Wizard. Want to have full control of the workflow? REST-based API will help you to create a decent solution which suits best for your customers. Code examples are included. Unlike other bitcoin or credit card payment processors, Mycelium Gear lets your customers send money directly into your wallet controlled by you only. You do not even temporarily entrust us the money customers pay for your products or services. Depend no more on your payment processor policies. 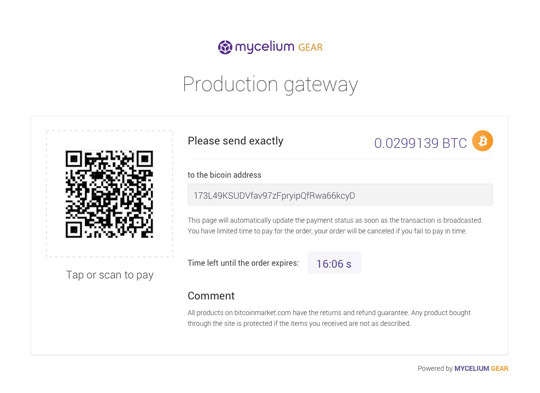 Mycelium Gear doesn’t require merchant to complete KYC/AML procedures to start accepting bitcoin payments. Whether you're a small online store running on Wordpress or a big online merchant with a custom built software, Gear provides you with just the right tools that you need to start accepting Bitcoin payments from simple payment widget to an expert API. Get familiar with code usage examples and tutorials by exploring our help center. Powerful and easy to use widget Wizard allows you to have full control over widget functionality and appearance. You can change the color scheme, add custom fields and multiple products, switch between regular and donation mode which allows accepting any payment with the amount set by a user. Diving deeper into gateway options you could configure default exchange rate providers and currency for prices, blockchain network type and many more.